David Klein was an American artist, best known for his influential work in advertising. Klein was born in El Paso, Texas in 1918, but moved to California where he attended the Art Center School (later renamed Art Center College of Design) in Los Angeles. During the 1930s, he was a prominent member of the California Watercolor Society and displayed his work at various exhibits, most notably the Golden Gate International Exposition of 1939-40. 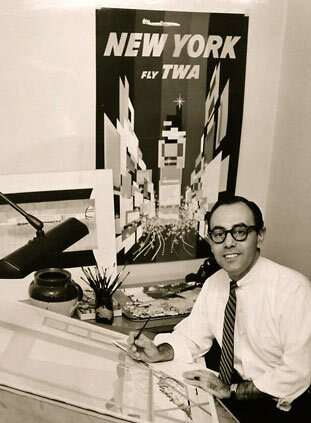 Although he produced illustrations for Broadway theatrical productions, Hollywood films, the United States Army, and numerous corporate clients, Klein is best remembered for the iconic travel images he created for Howard Hughes and Trans World Airlines (TWA) during the 1950s and 1960s.